Four seniors in the University of Maryland’s College of Computer, Mathematical, and Natural Sciences have been named 2018 Merrill Presidential Scholars. 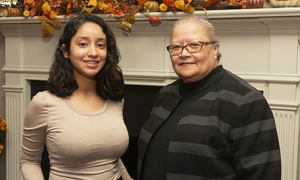 The Merrill Presidential Scholars Program honors the university’s most successful seniors, who each recognize a UMD faculty member and high school teacher for contributing to their education. 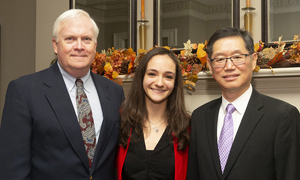 Danielle Arons, a biological sciences major, honored Inyong Choi of Walter Johnson High School in Bethesda, Maryland, and Reid Compton, a principal lecturer in the Department of Biology. “[Dr. Compton] helped me transition into college seamlessly, and his office door is always open if I have questions or problems to discuss,” Arons said. “[He] encourages students to excel academically while reminding us to enjoy life and stay grounded by balancing academics with other extracurricular activities.” Compton was also named as a faculty mentor by Merrill Scholars in 2008, 2015 and 2017. Deirdre Dolan, an atmospheric and oceanic science major, honored Julian Lazarus of Linganore High School in Frederick, Maryland, and Timothy Canty, an associate research professor in the Department of Atmospheric and Oceanic Science. “[Professor Timothy Canty] has been my greatest supporter by helping me find internships and other opportunities,” Dolan said. “With his guidance, I have worked to become the first student to be accepted into the five-year combined B.S. and M.S. program in atmospheric and oceanic science. I am extremely grateful to both of my extraordinary mentors who helped me grow into the person I am today.” Canty was also named as a faculty mentor by Merrill Scholars in 2015 and 2016. 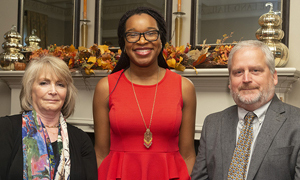 Somachukwu Umeozulu, a chemistry major, honored Cynthia Schnaar of River Hill High School in Clarksville, Maryland, and Jeffery Davis, a professor in the Department of Chemistry and Biochemistry. “[Professor Davis’] organic chemistry class was both interesting and engaging, and he provided guidance to my Gemstone team on our research project,” Umeozulu said. “He is always willing to make time for his students and I am very appreciative of all of his help.” Davis was also named as a faculty mentor by a Merrill Scholar in 2005. In addition, Justin Sylvers, a bioengineering major, honored Bonnie Dixon, a senior lecturer in the Department of Chemistry and Biochemistry. “I attribute much of my success to [Bonnie] Dixon,” Sylvers said. “For three semesters I was lucky to enroll in her chemistry courses. Her fast-paced lectures, along with her willingness to provide individual assistance as needed, helped me understand the material and learn how to speak up when I had questions.” Dixon was also named as a faculty mentor by Merrill Scholars in 2009 and 2010. 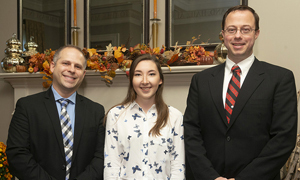 UMD President Wallace D. Loh welcomed Merrill Scholars, faculty members and teachers at a luncheon celebration on November 9, 2018, at University House.